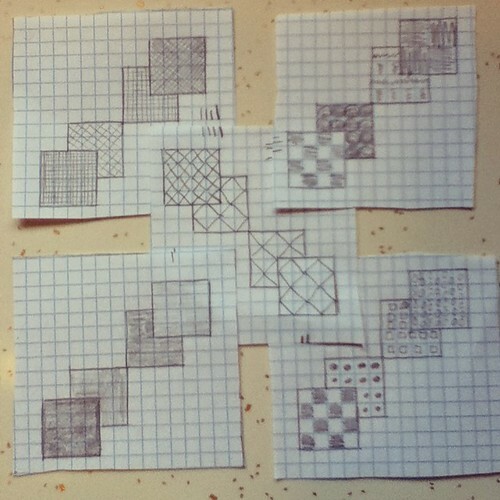 I've been spending a lot of time working on the skill builder sampler quilt. I got the top finished sometime last month and started basting. I've known for a while that I wanted to try thread basting. Spray basting is right out — I have asthma, and pretty much anything in a spray can makes me wheeze. (Even doing it outside wouldn't be workable. I'm a delicate flower that way.) Pin basting also sounded about ten different kinds of problematic, the biggest issue being that I have some stuff going on with my neck and upper back, and hunching over the quilt with pins would most likely ruin me for days. (And this is supposed to be fun, right?) Not to mention the difficulty in finding enough clear floor space — problematic because this isn't a huge apartment, and it has, you know, furniture all over the place. I had a helper, naturally. I enjoyed the process of basting for the most part. I thought it would be tedious, but I found it soothing and meditative. The long table in the photo is something my husband set up for me. It's actually two 2-foot by 4-foot pieces of melamine shelving on sawhorses. There are strips of lumber attached to the back to hold the two pieces of shelving together and make them sit nicely between the thingamawhatsits on either side of the sawhorses, which keeps it from shifting. The whole thing will come apart when I'm done, so it can be stored pretty easily. After I finished basting, I started out by stitching in the ditch along lengthwise down either side of all the columns of blocks and around the borders with invisible thread. 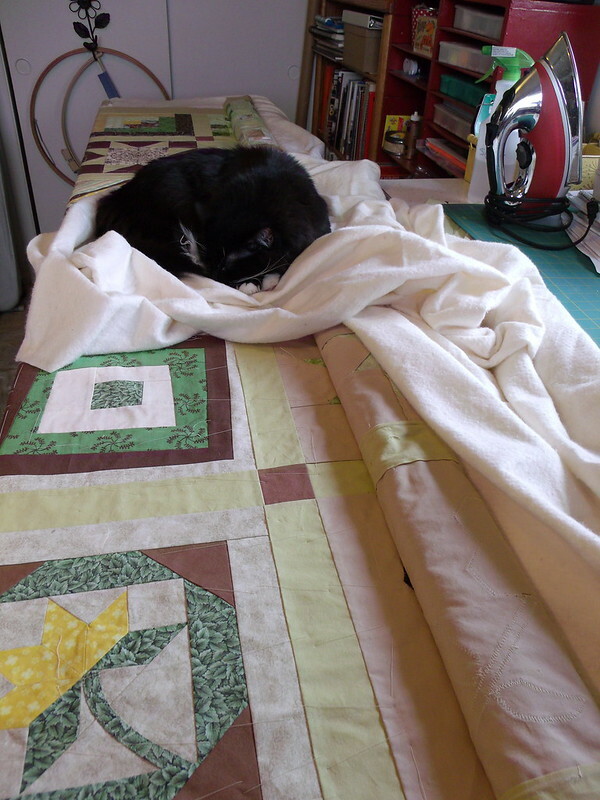 I intended to do across the rows of blocks, too, figuring I could use all the help I could get stabilizing things before I launched into free motion quilting. But I was too impatient to wait any longer for the fun part, and so far the quilt doesn't seem to be suffering any from it. 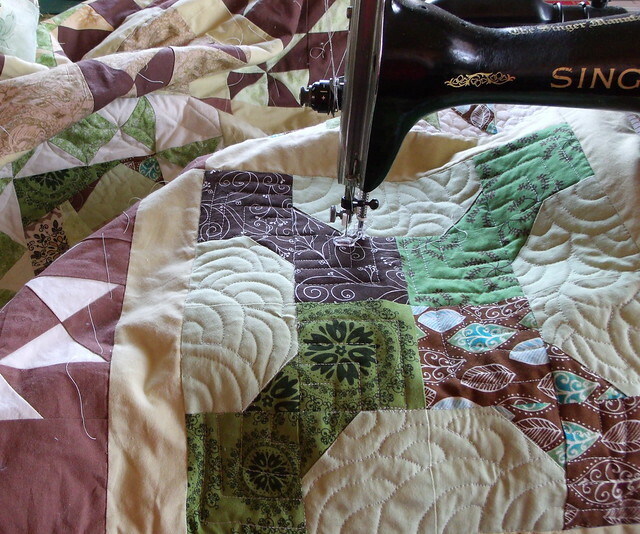 I'm still inexperienced at free motion quilting, and it does show. I'm not stressing out about it. My goal here is to get comfortable with the process. At the end, I'll look back and see if there are any seriously problematic sections that need to be ripped and re-done. Lengths of bobbin thread sitting against the back with big loops of needle thread flapping in the breeze, that sort of thing. But I'm waiting until the end to do that. I figure I'm better off fixing any problems serious enough to need to rip after I've had a little more practice. I'm also not marking any lines to follow. I considered it, but I decided it would encourage me to obsess over the inevitable flaws. The new plan involves three sections in a row on the bottom, then two more angled in the opposite direction above. I'm considering calling it done after the three, though. I think it might look better that way. Oh, and before I wander off to eat dinner, I have a tiny bit of happy news. 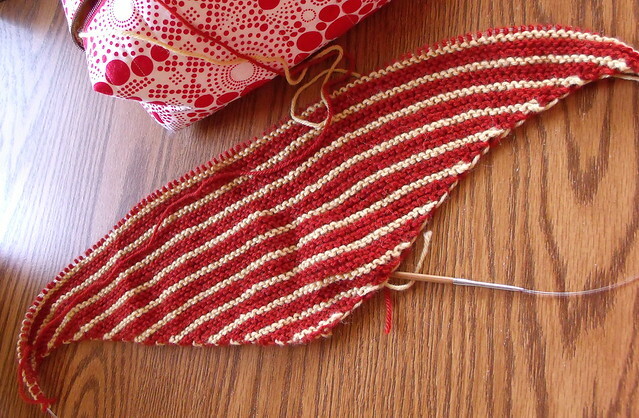 I can knit again — yay! It took forever before my wrist healed enough that I could knit comfortably for more than a few minutes. I could do push-ups before I could knit, even. It was the strangest thing. I worked on this for about two hours straight at my knitting group on Sunday, and my wrist was a tiny bit tired afterward, meaning I should probably not do any marathon knitting sessions anytime soon, but I'm so happy that I can knit again. 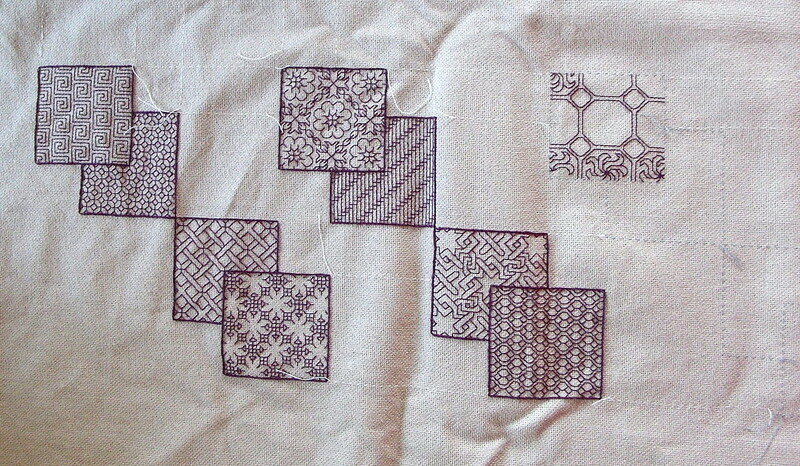 I love your blackwork project–so pretty. 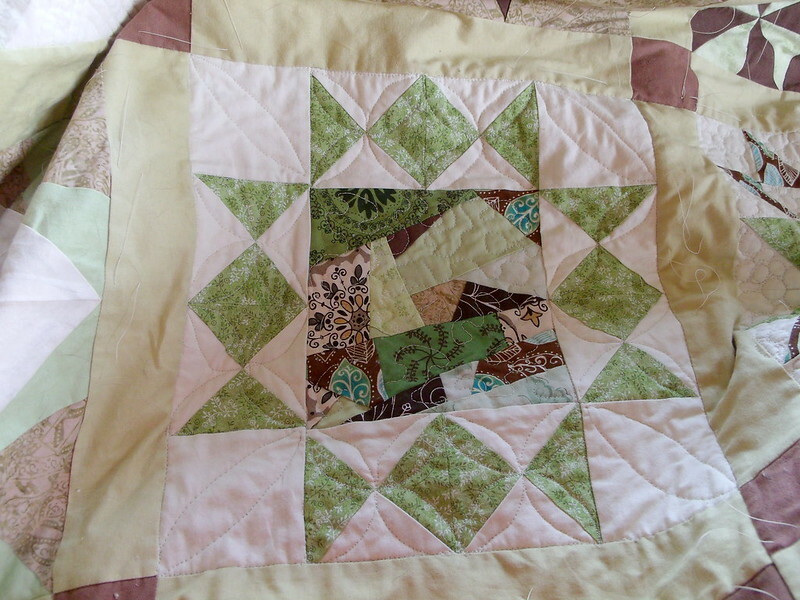 I should probably contact you off blog for this, but might you be interested in fabric scraps? I am cleaning my sewing room and have a small metric ton of fabric I’ll never use. Much of it in small (but useable) pieces.